P10 is a program that focuses on collecting all of the relevant information needed to begin a thorough evaluation and assessment of your current situation, opportunities, barriers, goals, and potential gaps. We explore all aspects of your business. What we’re looking for is your true culture. We look at our client’s current initiatives, objectives and ability to adapt to the imminent changes that lie ahead. There is tremendous power in this 10-step program which is conducted by Sales Builders’s expert staff. Do you have the right people in the right roles, working towards achieving the right things? What are your people – employees, clients, vendors, strategic partners; perspectives about your firm, services and products? Do you have the most effective processes in place to achieve your maximum results? Is performance being adequately measured? How are goals being established and monitored? What does past history tell us about future goals? What is the pace of your growth and the results being achieved? Our thorough investigative approach concentrates more on problem finding – uncovering barriers that may have been overlooked. How are your people executing their roles? Are you following traditional models, or is it time to bring a more innovative approach to your best practices? Agility is a key factor in a firm’s success. Market conditions demand a highly flexible approach to adapting to changes and opportunities. Profitability is required for all businesses to realize ongoing success. Maximizing your return on investments in people, approaches, and processes will impact profitability. Predictability of your results is the key for all companies. Accuracy in forecasting numbers today is just as important to a small emerging organization as it to a publicly traded Fortune 500 company. 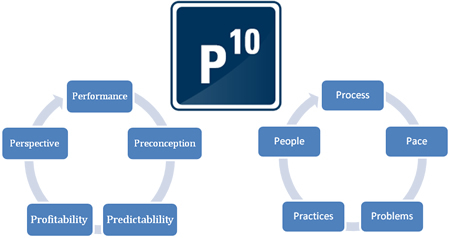 The P10 process will investigate all the critical areas of performance and offer you the power of “10” to help you prudently transform your results. Join us on several of our social media networks.